Spread the seasoning mix (from the taco kit) onto a large flat plate. Add the chicken strips and toss until evenly coated in the mix. Heat 1 1/2 tablespoons of the oil in a large non-stick frying pan over a medium heat and cook half the coated chicken strips for 5–7 minutes until golden, crisp and cooked through, turning occasionally. Remove chicken from pan and set aside. Add the rest of the oil to the pan and cook the remaining coated chicken pieces. 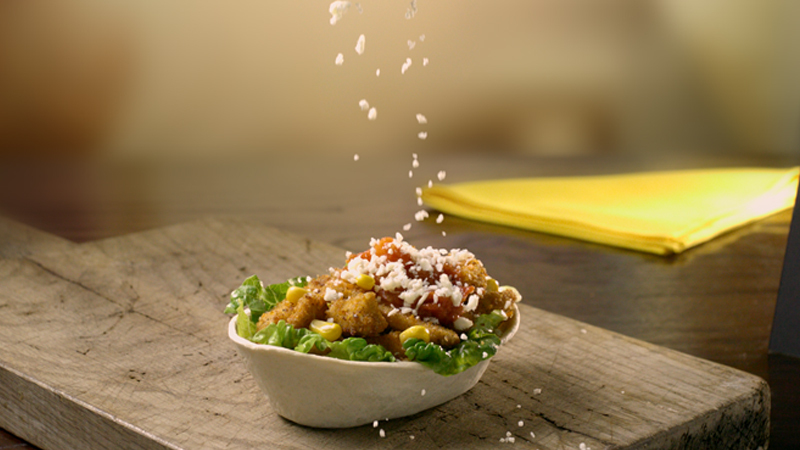 Divide the shredded lettuce between the tortillas and top with the crispy chicken pieces and sweetcorn. Top each with a spoonful of salsa (from the taco kit) and a sprinkling of crumbled feta or grated Cheddar. Try using turkey breast strips instead of the chicken. Mix the salsa with soured cream and add some sliced red chilli pepper for an extra creamy and spicy topping.